Low-temperature heat sources (80–120 °C), including low-concentration solar, shallow-well geothermal, household cogeneration and industrial waste heat, are widely abundant and have the potential to be recovered as electric energy. The integration of distillation with salinity gradient power (SGP) technologies has been proposed as an alternative to traditional technologies for harnessing such low-grade heat. In this method, heat is used to distill a salt solution, thus producing a concentrated solution and pure solvent. Controlled mixing of the two solutions at different concentrations in a salinity gradient power process converts the mixing Gibbs free energy to useful work. We analyzes the energy efficiency of distillation-SGP by conducting a thermodynamic and energy assessment of the distillation stage. Counterintuitively, the highest efficiencies are achieved by utilizing the least number of distillation effects but matching the boiling point elevation of the working solution to the available temperature difference. This is due to the entropy production during heat exchange between the distillation effects, where heat flows across a temperature difference, which is the main energy loss. 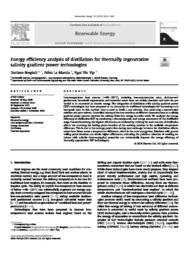 Solutions with greater boiling point elevation can obtain higher efficiencies, indicating the judicious selection of working solutions with suitable thermo-physical properties can substantially improve the energy efficiency of Energy conversion SGP technologies.